Those designer kicks you bought in the sales might have looked great on the shelves, but are they right for your feet? Most people fall into three categories of foot type – normal foot, flat foot, or high-arched foot – and your shoe needs to work for you. For example, if you have a flat foot you’re looking for stability while an arched foot needs flexibility to encourage foot motion. Ask the shoe store staff to check your foot to see which foot type you have. And think about the surfaces you will be running on and the distances you intend to cover. If your new training schedule could put an Olympian to shame, think again. If you run too far too soon it may lead to such overuse running injuries as shin splints, runner’s knee, or ITB syndrome. When you’re new to running, be conservative in your training and let your body adjust to the demands you’re placing on it. A good gauge is to increase your weekly mileage by 10 per cent each week. 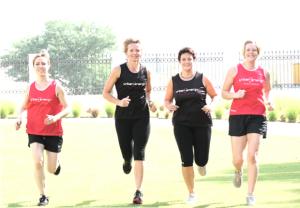 And if you’re really new, start with a walk/run programme. Some runners think that if they run with a longer stride (where the heel lands ahead of the body’s centre of gravity) they will run faster and more efficiently. This isn’t the case. In fact, what happens is that energy is wasted because the runner is braking with each foot strike and the ankles and knees are absorbing a lot of force. Focus on landing mid-sole, with your foot underneath your body with each step. A short, low arm swing will help you to keep your stride short and close to the ground. Imagine you are running on hot coals and this will help you to keep your steps light and quick. Swinging your arms side to side, or holding your hands by your chest will actually make you more tired as you will quickly start to feel tension in your shoulders and neck. As you run, keep your hands at waist level, about where they would lightly brush your hips. Hold your arms at a 90 degree angle, with your elbows at your sides. Your arms should rotate at the shoulders, not the elbows, and they will swing back and forth. Keep your posture straight and upright. It is common at the end of a run to start to slouch, so if you feel yourself slouching, concentrate on lifting your chest. Dehydration will affect your performance and your health. An hour before you run try to drink 450ml to 700ml water. Use thirst to guide you when to drink during your runs. During longer sessions (60 minutes or more), some of your fluid intake should include an electrolyte replacement to replace lost sodium and other minerals that you lose through sweat. At the end of your run rehydrate with water or an electrolyte replacement drink. Use the urine test to check if you are hydrated enough. If your urine is dark yellow, you need to keep rehydrating. It should be a light lemonade colour.